Residents and visitors alike wandering around Christchurch cannot helped to have noticed the nineteen Blue Plaques put up by the Christchurch Local History Society (which in 2011 became Christchurch History Society) at locations of historic importance, normally on buildings as close as possible to the true location. This virtual historic tour around the Priory Area of Christchurch will show some of the secrets that the town has to offer. The tour starts from the Priory Car Park, which used to be the monastic precinct. Once, no females would be permitted here. Most of the monastery buildings were sold off by Henry VIII, he did, however, give the Priory to the townspeople. There are still some of the monastic precinct walls standing and a building towards the Town Quay, inside the wall, perhaps once a bakery or a brew house. By walking back along Quay Road, which at one time was Monastery Street, you will very soon see to your right is Christchurch Priory standing majestically over the town. 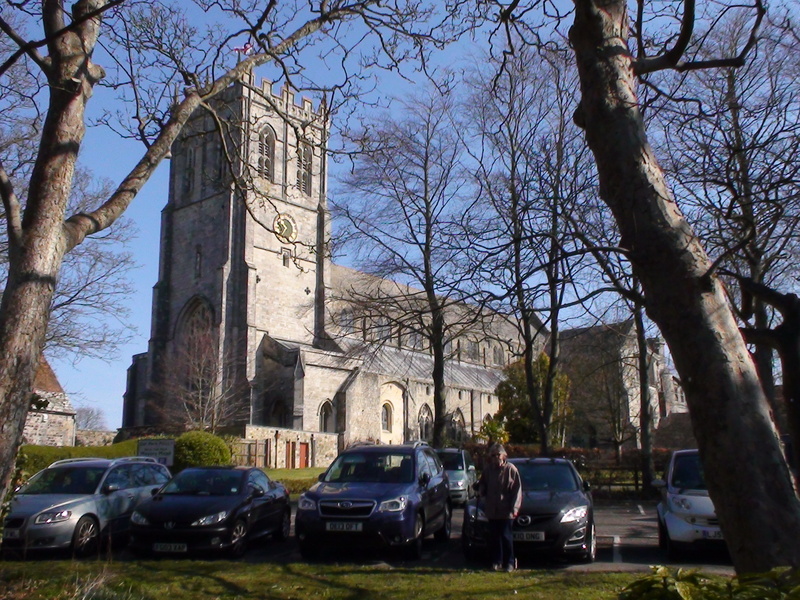 As you leave the Car Park if you look to your right the south side of Christchurch Priory is in view. For details of Christchurch Priory follow this link. At the entrance to the Car Park on the right hand side and set back is the Porter’s Lodge. Together with the stone building visible at the back of the Car Park , the Porter’s Lodge survived the ravages of the Dissolution in the the 16th century. Within are the remains of wall paintings from the monastery era. Just beyond can be seen the remains of the Priory gateway where the main entrance to the monastery would have been. As you proceed along Quay Road you will follow the wall to the graveyard of Christchurch Priory and a view of the North Porch of the Priory. It is in the first floor room above the Porch that the Christchurch History Society holds its Archives. Use this link to get more information on the Christchurch History Society Archives. On the Christchurch Blue Plaques Millennium Trail Leaflet1 this location is identified as number 23 but no Blue Plaque has been erected. To continue the tour, go to the Christchurch Workhouse.